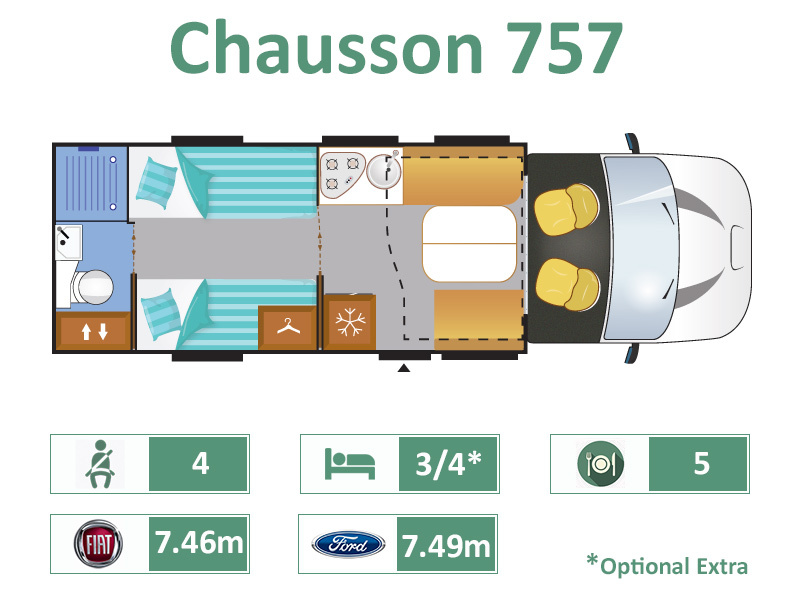 Chausson`s 757 model is hugely popular with those who seek order and conformity ! .. This model has a large front “Smart Lounge” with hidden seat-belted jump seats, and an electric drop-down double bed, then there`s the well equipped mid-kitchen, with large larder style fridge and separate freezer. Behind the first compartment door is the open and spacious bedroom with large single beds either side, with cavernous storage below each one, and tall boy wardrobes either side. Behind the next and last compartment door is a full-width washroom with separate shower cubicle, wash basin, wc and again good storage cupboards, Including on the off-side a `Ski-Locker` which can be accessed from inside or out-side the motorhome.